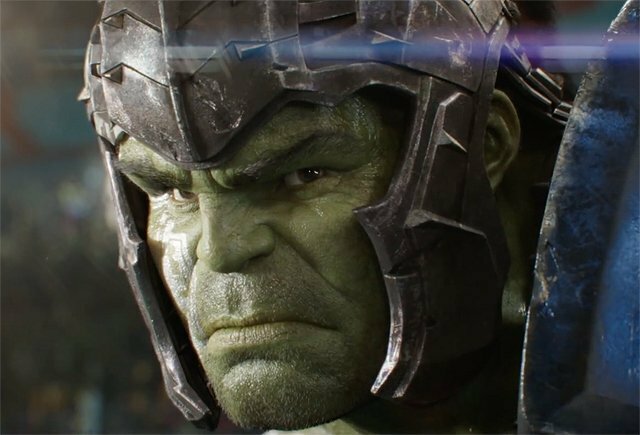 Hulk Roks Thor in Ragnarok! (Now: Art of Vfx coverage)! I love this new picture of The Hulk. Just the detail in it is terrific. I could assume this is ILM's work but not certain. Their Hulk for the new MCU series(The Avengers,Age of Ultron,etc) is my favorite of their Marvel work so far. Last edited by ShaneP on Tue Nov 21, 2017 2:38 pm, edited 4 times in total. That was some rough looking CG (save for that amazing close-up of Hulk), but I can forgive it by sheer virtue of the fun in that trailer. Does Hulk's run look...off to anyone else? I know he's wearing some heavy armor, but when he starts sprinting the animation looks like he weighs three times as much as usual, like he's struggling to run. Awful squat and low to the ground. Hulkstipation? Maybe he needs more Metamucil? ILM Vancouver and San Francisco did just over 400 shots for the film for the Hulk/Thor arena battle, Hulk in the suite, and the Thor escape to the Quinjet. Didn't think this was nearly as good as people were making out. Forgot all about it as soon as I left the cinema. Liked the fun, colourful vfx, but could have done with half as much of it.